A frothing, bubbling Chardonnay fermentation today at TWWIAGE left no doubt whatsoever that harvest 2015 is well and truly underway. The first grapes, Sauvignon blanc, came in exactly two weeks ago, and now Chardonnay grapes are arriving almost on a daily basis. No estimate as to when the first red wine grapes will arrive, but all signs point to 2015 continuing to be an early vintage. The last time I photographed fermenting Chardonnay at TWWIAGE was back in 2011, October 7th to be exact, so it would seem that harvest is very early this year. However, the Chardonnay goes through a long, cool fermentation and probably won't be finished until mid-September, so, taking that into consideration, harvest is still only about 2 weeks early. I just love the sights and smells of fermentation. Happy International Cabernet Sauvignon Day. Somebody told me that today was International Cabernet Sauvignon Day (ICSD), so I was going to wish everyone a happy ICSD - until I looked online and saw that ICSD might have been on the 27th of August, or even yesterday the 29th. Sigh, whatever! Anyway, besides, I would have been wishing everyone a happy ICS-evening, as I spent my day working in amongst Cabernet Sauvignon vines instead of drinking the finished product. And then I went and had a Sauvignon blanc with dinner, so I hope everybody just had a happy day, full stop. Tonight was meeting no. 2 of the marketing class that I am taking and I'm already horrified: why anyone would want to start their own winery is beyond me. It's all fine and dandy to want to go ahead and make wine, but then you have to sell it. And in such a saturated market, selling wine can, apparently, be quite a struggle. This evening, my classmates and I were split up into small groups and given a simple marketing assignment to hash out between us. (These are the groups that we will remain in to work on a business proposal we have to write for our midterm exam. I am in an interesting group.) My little platoon of promoters and I were, for the most part, happy with the mini-marketing strategy that we had decided upon. One by one the groups presented their plans to the rest of the class. The instructor then informed us that we had all failed, oops! Not one person in the class had suggested a mission statement; snappy and aspirational, defining the virtual winery's position in less than 5 words. Hate when that happens. It's a wine-marketing battlefield out there, folks. Let go of my grapes! Today I spent a bit of time performing various vineyard operations; training baby vines up stakes, clearing weeds from the bases of some vines and pulling leaves (and laterals) in the fruit zone. Just as I was about to remove what I thought was a crumpled up, dead Syrah leaf I realised, right as I was about to grab it, that it was a rather large moth. At about 3.5 inches wide it is the biggest moth I have ever seen. The Achemon sphinx moth (Eumorpha Achemon) is an occasional California vineyard pest as it is quite fond of feeding on wild and cultivated Vitis species. The adult moths are rarely seen as they fly only at night and usually hide during the day. Achemon caterpillars are rapacious feeders and can consume 9 Vitis leaves in a 24 hour period. Great! Not exactly the type of leaf removal I was planning on. I haven't spotted any naked vines thus far, so I think Vinoland is safe - for now. Despite the lack of rain - for the past three winters - there are plenty of weeds still growing between the rows of vines in Vinoland; mallow, fluvellin, stinking goosefoot, plantain, bristly oxtongue etc. I wouldn't say they are exactly flourishing, their flowers seem smaller than normal, but they are persisting reasonably well. There are even some California poppies still blooming, but, just like the weeds alongside them, their flowers are also rather diminutive. One weed that seems to be doing even better than all the others is prickly lettuce (Lactuca serriola). But even the flowers of the prickly lettuce seem to be reduced in size this year. Prickly lettuce, a native of Europe, can grow up to about 6 feet tall, (though I doubt they will in 2015) and they are indeed prickly as they have a row of spiky hairs on the underside of their leaves. And they can be eaten in a salad (thanks, I'll pass). But it is the cheery, pale-yellow, chicory-like flower that is the most pleasant feature of Lactuca serriola. So delicate looking, but so hardy. Let's hope for some rain this winter. Just recently, I came to the alarming realisation that my brain was turning into mush. And, to try to rectify that, I thought I really should take a class at Napa Valley College to whip my atrophying grey matter into shape. 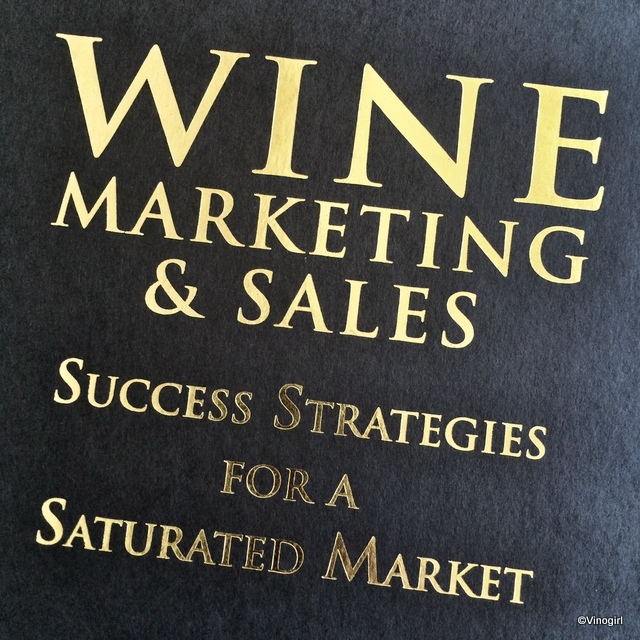 So, tout de suite, I enrolled myself in a wine marketing course. The first session was held this evening. Not having the slightest idea about anything to do with marketing, I had no notion of quite what to expect from an entire semester dedicated to this particular subject matter. (But I knew I wanted to learn.) The first class was a very interesting, fast-paced, statistic-filled introduction - by instructor Paul Wagner - to all things marketing, not just wine marketing. Fun. My brain was so stimulated when I got home that I needed to have a cup of tea, watch a bit of telly and write this post to decompress. I'm looking forward to next week. Today is my and Vinomaker's wedding anniversary. Now, I am one of those people who have to celebrate an occasion on the actual day it happens: I simply cannot put things off until the weekend. And because tonight is a school night we chose somewhere a little more on the casual side for our anniversary dinner. Fumé Bistro & Bar is more of a neighbourhood restaurant than a fancy tourist destination. Located on a partial frontage road, alongside Highway 29, Fumé definitely has more of a low key atmosphere. Dinner was really great - my halibut served with a lemon parsley risotto was delicious, as was Vinomaker's Cajun rock shrimp/andouille sausage fettuccine. Yum! 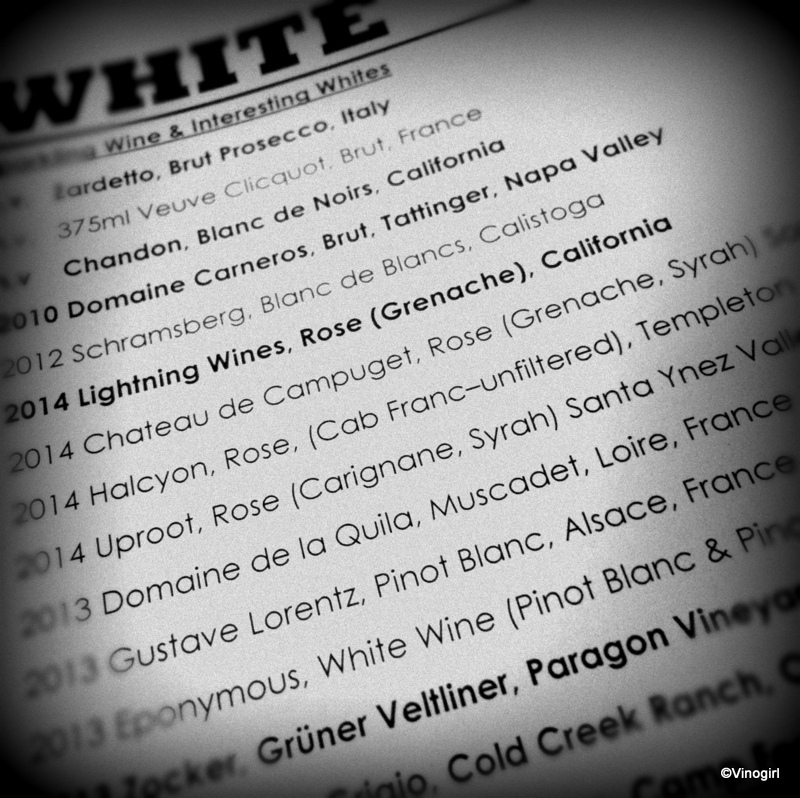 The wine list at Fumé is, in my opinion, passable. I just wish they had more of a 'by the glass' wine selection. Don't get me wrong, Vinomaker and I did not go thirsty. I just think the wine options on the restaurant's wine list aren't very inspired. Laird, 2014 Pinot Grigio (Napa Valley). Epiphany Cellars, 2013 Grenache Blanc (Santa Barbara). Zocker, 2013 Grüner Veltliner (Edna Valley). Phipps Family, 2011 Zinfandel (Dry Creek Valley). And last, but not least, a very unusual late harvest Chardonnay (yes, a Chardonnay), a Reynolds Family, 2006 Naughty Sticky (Napa Valley). Unusual name, unusual grape variey for a late harvest wine, but still quite enjoyable. Fun. There were quite a few stand out cars for me this year; a Screaming Mimi-red 1957 Ford T-bird, a sky blue 1954 Chevrolet pickup truck and a jet-black 1967 Chevelle SS 396. All very nice cars. But my favourite car at this year's event was a 1955 Chevrolet Bel Air that had not, as yet, been restored to its former glory. 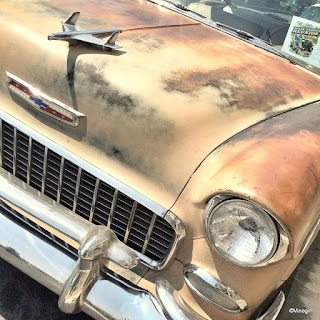 This photograph does not do justice to the richness of the patina that the passage of some 60 years have bestowed upon this car - it is uniform and quite lovely. No doubt with some TLC, and a bucket load of money, this Bel Air will once again be the shiny, eye-catching beauty it was when it first rolled off the production line. I sort of like it now. I saw a lot of grapes, actually. Of late, I have been reading in the local newspaper about the beginning of the 2015 harvest, hither and thither, in Napa vineyards. It wasn't until my commute to TWWIAGE this morning that I witnessed several harvests for myself. (Notably, Sauvignon blanc on the Silverado Trail - belonging to Mondavi, methinks.) It's a fun time of year, but also the beginning of a very busy time. This curlicue Orange muscat tendril, photographed some three weeks ago, is now a thing of the past: these vines are definitely going through veraison. Another vintage is on the way. Or not so itsy bitsy. This yellow garden spider (Argiope aurantia) is freakin' huge, and I don't like her. But Vinomaker loves her, in fact he has given her a name - Sylvia. Lovely! Sylvia got in my way this morning as I was finishing securing the bird netting on the Pinot grigio vines. Luckily, later in the day, she moved from right below the fruiting wire to just above the drip line enabling me to complete this particular vineyard op. Still, I wasn't happy about being in such close proximity to this leggy femme fatale (there was something grotesquely parceled up to her right), but I tolerated her presence as she is an important part of the predator/prey food web that ensures that Vinoland is, for the most part, a naturally pest free zone. But still, don't like it. I'm so excited. I have a dark-eyed junco nest in my Pinot grigio vines. With Vinomaker's help, I spent most of my day putting up the bird netting in the Pinot grigio vines. Just as I was pulling some unwanted lateral growth from higher up in the canopy I noticed this nest. As the nest was just above eye level, I had to stand on my tiptoes to see inside - four eggs, wow! Just then I realised I was being harangued by a dark-eyed junco female who wasn't nearly as excited with my find as I was. Sorry momma, let me just get right out of your way. Today is the 4th annual International Albariño Day (IAD). Who knew? I didn't. And I can't even remember how I heard about IAD, but I have had a Post-it note on the side of my laptop to remind me about it for almost 2 months now. Then I forgot, completely ignoring the Post-it note until yesterday afternoon when I decided I needed a domestic Albariño with which to celebrate IAD 2015. 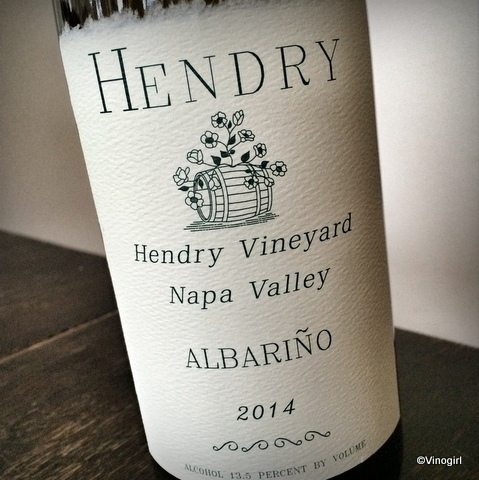 And I knew exactly which domestic Albariño I wanted: a Hendry Albariño. After a quick phone call to the winery to make sure somebody would be there I headed over to Hendry Ranch (with Vinomaker and Vinodog 2 in tow). Located on the benchlands between the Carneros and Mt. Veeder AVAs, the folks at Hendry have been farming wine grapes since 1939. The Hendry family grow 10 different grape varieties on 114 planted acres in the cooler climate, woodsy-westside of the Napa Valley. On arrival at the winery, I was greeted by name (it's the small things that make a difference) by Therese who I had spoken with on the telephone. Vinomaker and I were invited into the lab/office and Therese went off to grab a fresh bottle of Albariño for us to taste. In the lab, doing some research on a computer, was George Hendry the owner, farmer and winemaker. George stopped what he was doing and spent some time chatting with me and Vinomaker about his vineyard and his knowledge (and Napa Valley history) of the Albariño grape. When I told George that I wanted to purchase a bottle of his Albariño to drink on IAD, he smiled and said, "I learned something new today." We all laughed. And what did I learn yesterday, besides the vital statistics (clone 3 on St. George rootstock), of Mr. Hendry's Albariño vines? Not much, but I was however reminded of something. And that something was this: that on any given day in the Napa Valley one just might happen to chance upon a passionate individual, in a building that feels and looks like a real winery, who will be more than happy to take time and prattle on about all things grape with you, who walks the talk, and who then is eager to share his wine with you. It wasn't about the ostentatiously grandiose, maniacally-marketed, gimmicky green-certified, artwork-crammed temples to all-things-bacchanalian. The real Napa Valley is none of those things; it is about the dedicated farmer who painstakingly nurtures his grapevines in order to make the best vintage of wine that Mother Nature will allow. A refreshing experience. The wine? The Hendry, 2014 Albariño (Napa Valley) is delightful. With lemon, grass and a pineappley/passion fruit vibe the wine is crisp, clean and right on point. This Albariño does not mess around on the palate, with well focused acidity it leaves the old taste buds wanting more. Good thing that Vinomaker bought 6 bottles. Happy International Albariño Day to all!